This month it is with great sympathy that we write to you after hearing of the passing of David George Crickmay, Dave to all of us. 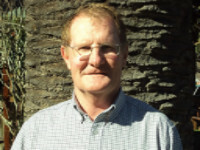 Dave was much, much more than a friend and colleague to many us, he was a mentor and example to an entire generation of sawmillers, he will be sorely missed. May he rest in peace. Our condolences go out to his family at this trying time, and one things for sure he will never be forgotten by the sawmillers of SA. Good news this month is that the Broad-Based Black Economic Empowerment Amendment Act (53/2003): Codes of Good Practice on Broad Based Black Economic Empowerment: as amended, came into effect on 21st April 2017. It’s been some three years in the drafting and is tailored expressly to the forest sector. SSA, FSA and PAMSA played a substantial role in the process of aligning these codes with the DTI’s generic codes. If there is any miller who did not receive the official SSA e-mail carrying a copy of the gazette, please just drop us a line here at the SSA office and we will send you one. It’s getting closer to that time of the year again where we need to start preparing for the AGM, so here is the first reminder and request that you place the date in your diaries. The SSA AGM will take place on the 8th June 2017 at the SAFCA house in Johannesburg. Official notice will follow soon. News from the market place is that it seems demand for sawn lumber has slowed down as we get deeper into the year; this may or may not have something to do with the spate of Easter and Mayday holidays. Lets hope that this is just the case and that the healthy start we had to the year gets going again once we are over this period. We have learnt from a reliable source that there is a substantial Brazilian company who manufactures sawmilling equipment, who is looking for a distributor for their products in SA. If anyone has any interest, please give Don Preen in Nelspruit a call to discuss. One last note is a reminder to all those who operate up in the Northern and Eastern parts of the country to start preparing for the dreaded fire season. Let’s hope it will not be a destructive one this year and that all sawmilling resources will be safe. Other than that and until next month, in the words of Dave Crickmay “keep cutting straight and drying flat and you will make money”. Wood-Mizer Africa’s busy stand at Promote 2017. 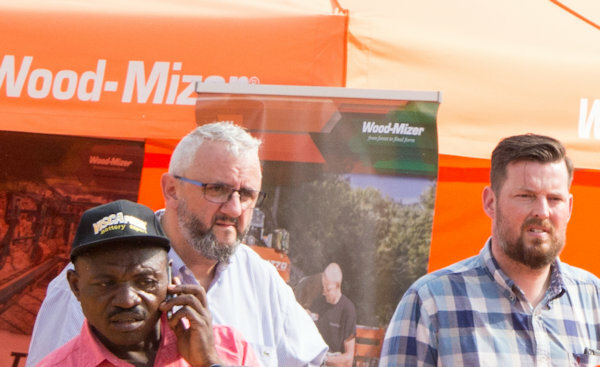 Wood-Mizer Africa’s dealership network in Africa has grown further with the recent announcement that an authorised Wood-Mizer dealership has opened its doors in the Republic of Cameroon’s capital, Yaoundé. The new dealership in Cameroon brings the number of locations where Wood-Mizer has a dealership presence to 30. 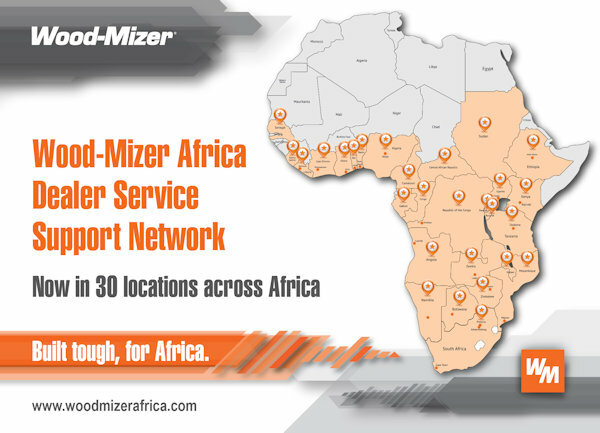 Wood-Mizer Industries decision in 2011 to increase its drive into Africa through its local subsidiary, Wood-Mizer Africa, relied heavily on rolling out a dealership network across Africa that can give sawmillers the service and support they deserve. Limited technical, maintenance and training support, together with the short supply of spare parts, have previously restricted the ability of sawmillers to start and grow successful sawmilling businesses in Africa. This contributes to the trend of logs exports with limited local processing. Wood-Mizer’s dealership network in Africa gives sawmillers access to the expertise, service and support they need to run profitable sawmilling businesses across the continent. 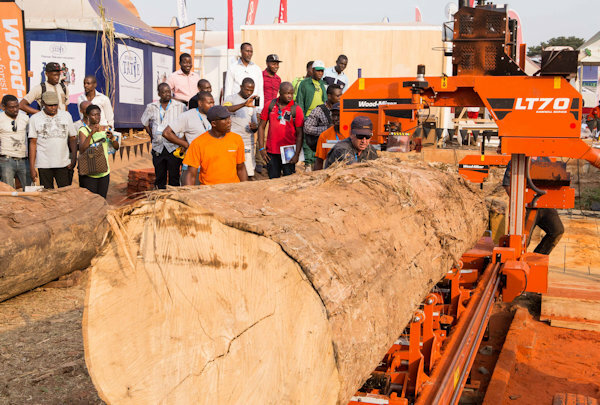 A recent agreement between Wood-Mizer Africa and Est Snoop Import – Export was signed in Cameroon at the Promote Trade Show that appointed the company as Wood-Mizer’s dealer in Cameroon. Est Snoop Import – Export is a specialist in the timber industry with offices in Cameroon and Belgium. Wood-Mizer currently has over 50 sawmills operating in Cameroon with this number positioned to grow rapidly now that machines, blades and spares are readily available. “The partnership promises the right mix of advice, support and care that sawmillers in Cameroon can rely on to start profitable sawmilling businesses in Cameroon,” Mr JJ Oelofse, Wood-Mizer’s Corporate Director for Emerging Markets, said during the conclusion of the agreement between the two companies. Mr Joris Smeets, Est Snoop Import - Export’s Managing Director added that the company has wide experience trading in Cameroon. “The company’s sales, service and support infrastructure in the country has already broadened its scope to include Wood-Mizer’s complete range. Wood-Mizer has a strong service and support tradition that we are now eager to copy in Cameroon. “We look forward to adding our weight to the successes that Wood-Mizer has already achieved on the continent,” Mr Smeets concluded. 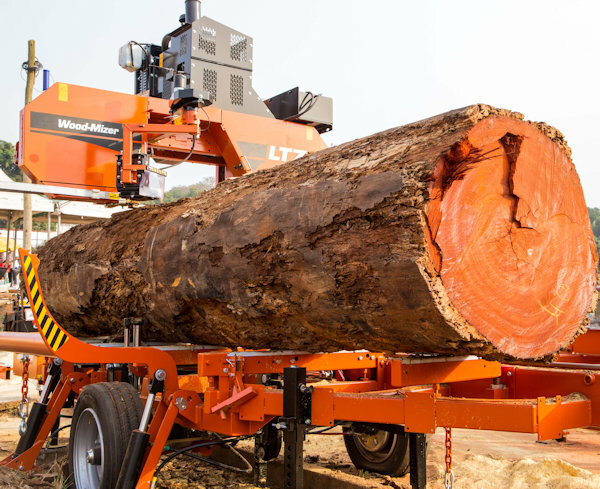 A large diameter hardwood, 1,9 ton Padauk log cut into high value export quality timber on a Wood-Mizer’s LT70 Super Hydraulic sawmill in Cameroon. Wood-Mizer Africa’s new dealership in Cameroon is headed up by Cyrille Tiaya Zogti (left), Patrick Lovigny (middle) and Joris Smeets (right). A new technology known as "CatLignin" has been developed by VTT Technical Research Centre of Finland to produce reactive lignin from pulp industry side streams to replace toxic phenol compounds found in wood adhesives that are commonly used in wood products and furniture. How green really are tall timber buildings? Heyfield timber mill: What's happening to Australia's largest hardwood sawmill? Four Friends go hunting for the weekend. The hunting camp has 2 bedrooms so they have to share. Nobody wants to share with Koos as he snores heavily. So they decide to take turns, with Jan being first. The others ask: "Man - what happened to you?" Jan says: "Koos snored so loudly I just sat up all night and watched him"
The next night it's Gert's turn, with the same results the next morning. "Man - he just about took off the roof"
The next night it's Frikkie's turn, a 140kg red bearded front row player. Frikkie arrives at the breakfast table the net morning, bright-eyed and bushy tailed. Koos is a mess, eyes bloodshot with dark rings around his eyes. They ask Frikkie what happened. and kissed him good night. Koos sat up and watched me all night." Copyright © 2017, SSA, All rights reserved.